Now, about Neriko: I'm not going to have time to research so what I'll say is just what is stored in my aging gray matter. Neriko, of course, is "Kneaded" incense and has a very close connection to the Japanese aristocracy and Imperial court in ancient times. You will find mention of it both in the "Tale of the Genji" and Lafcadio Hearns Seminal work "In Ghostly Japan." where it is mentioned in reference to "Incense Contests" Now these are not the incense contests we know today as "Kodo." These are contest on Making incense. A primary use for this kind of incense was in scenting the sleeves of the Kimono's. 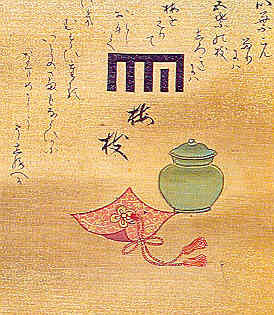 Neriko or Awaseko came to be developed as "Seasonal Incenses" and different formulas were developed for Spring, Summer, Winter, Fall, with others that were all seasons. In time, Neriko's came to be used in the "Tea Ceremony" where they have their closest association in modern times, usually used in Winter and Fall and replaced by sandalwood in Spring and Summer. Next article will be on the ingredients of kneaded incense.